A Conference was held in Doha, Qatar, to discuss “the Role of the High Commissioner for Human Rights in Promoting and protecting Human Rights in the Arab region”. The Conference was attended by nearly 250 Arab and international human rights organizations, and more than 43 personalities responsible for human rights dossiers worldwide. Among the participants were 17 delegations representing foreign ministries of Arab countries, human rights commissions or legal committees in parliaments and consultative councils in the Arab region, in addition to the participation of a group of special rapporteurs and international treaties bodies. The human rights meeting was of a very large scale and is probably unprecedented in the Gulf region. 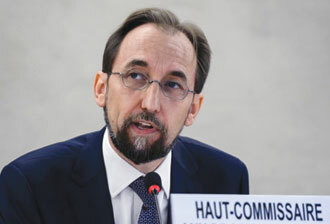 The UN High Commissioner for Human Rights, Prince Zeid bin Ra’ad Al Hussein, delivered a speech, which he began by acknowledging that “The Arab region has not seen this level of violence, killing and displacement of innocent people as witnessed in these days”Unfortunately, this reading of the events is quite true. Violence is unprecedented with respect to its intensity and the fact that it is spreading over vast areas, transcending Arab countries into Muslim countries to reach Europe, America and other areas. First, the provision of security for the citizens in the face of terrorism, which is the duty of every state. However, maintaining security and combating terrorism, should not be used as a pretext to infringe on human rights, to gag the freedom of expression or to stifle other freedoms. According to Zeid, security-based solutions and approaches that do not respect human rights and the principles of justice and equity, will ultimately lead to nothing but more extremism, and a growing sense of frustration and hostility towards governments. The final outcome will then be: the regeneration of violence and counter-violence. The crux of the matter, is that maintaining security and combating terrorism does not require, and should never require, infringement on the rights of citizens, or expanding the umbrella of accusations to the extent of charging activists with practicing terrorism. Combating Al Qaeda and ISIS terrorism is possible, while maintaining the rule of law and respect for the fundamental rights of citizens. Otherwise, proceeding without a commitment to human rights standards in the face of terrorism will only create grounds for the growth of terrorism, rather than extinguishing it. In a related context, the UN High Commissioner called for combating the roots of terrorism, noting that in the long run, addressing terrorism will not lead to results, unless the underlying causes are addressed. These include marginalization, poverty, and inequality among individuals, as well as the presence of educational curricula inciting hate and discrimination against the other. He added that any economic well-being, or the achievement of good growth rates that is not based on the wellbeing of humans, the promotion of their rights, and strengthening their role in the political decision-making process; may only delay-but not end- the popular movement of the opposition. This, he noted, is because a human may live by food and drink, but a human spirit can only live by being honored and protected from humiliation and oppression. Second, Arab governments have signed international human rights agreements, but stripped them of any value, through lack of implementation. Prince Zeid bin Ra’ad pointed out that the Arab states have gone a long way in the ratification of the conventions and treaties pertaining to human rights and international humanitarian law, however, “… Arab citizens in general do not touch the significant impact of these legal obligations in daily life. The acceptance of international legal obligations requires seeking to modify and develop national legislation to enable individuals to exercise their political, civil, economic, social and cultural rights”, he said. In other words, the Arab governments’ ratification, amid much tardiness and reluctance, is not enough. In order to get rid of international pressure, some states have resorted to accession and ratification of treaties without having the slightest intention to abide by them at all, neither through application on the ground, nor by incorporating them as part of national laws. In contrast to that, the idea behind ​​obliging governments to sign such treaties, is based on binding such governments and to gradually compel them to implement. But it seems that Arab governments have so far succeeded in proving the error in the vision of the other party, which wrongly believed that merely signing treaties is sufficient to commit governments and lead them along the path of human rights development. Prince Zeid added that the Prophet Mohammed, peace be upon him, had emigrated to Medina in search of a wider space for deployment of faith, and the early companions took refuge in Abyssinia in search of safety, “How can we not open our doors to refugees and protect them and expect others to undertake this duty?”, asked Al Hussein in a reference to Syrian refugees and others. The High Commissioner stressed the need to build on these commonalities and human values, and to accelerate the accession to the rest of the core human rights treaties, and to implement and comply with them in practice and behavior.